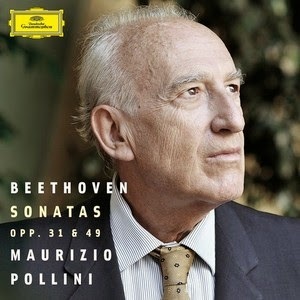 Pollini reaches the end of his Beethoven sonata cycle with this release. In fact the recordings began in the 1970s, so “cycle” may be the wrong word – not that that has stopped DG from using it in all their publicity. But there is more to this recording than just filling in the gaps. Pollini takes a chronological sequence of sonatas and gives us a series of sensitive and insightful readings. There is nothing extreme about his playing, yet every phrase is filled with character. The results will certainly satisfy Pollini’s many loyal fans, but should also find appreciative audiences further afield. Given that he is in his early 70s, listeners can be forgiven for approaching Pollini’s recent recordings with a sense of trepidation about the maintenance of his technique and interpretive abilities. Technically, there is little to fault here. He is as dexterous as his interpretations require. There is rarely any sense of virtuosic display, but then Pollini no longer needs to impress anybody. Instead the interpretations are always fairly grounded, more Classical than Romantic, and with a clear sense of underlying pulse dictating all tempo choices. That said, some his playing is surprisingly fast. The opening movement of Sonata No. 16, for example, is sprightly, although without ever seeming hurried. His palette of dynamics and articulations is quite restricted, although there are always impressive subtleties within that range. His touch is usually legato, with fine variations of attacks within the flowing lines, but rarely any emphatic separation. The arpeggio figures in the first movement of Sonata No. 17 flow and cascade satisfyingly – velvety waves of sound. But the ever-present Classical restraint returns to the fore in the middle movement, surprisingly slow, but stately and dignified. Perhaps that restraint goes too far at times. There is always formality here, but only occasionally does it feel like it has tipped into insensitivity. Which brings us back to issues of age and experience. What are the excesses that Pollini is trying to avoid? And does his “knowing” approach tell us more about the music through his efforts to prevent it becoming distorted? These performances work best when Pollini is able to convince us of his personal investment in the music, when his narrow range of articulations and dynamics becomes a language of intimacy rather than restraint. And he doesn’t always sound like the all-knowing old man. The final movement of Sonata No. 18 sparkles with a naïve-sounding joie de vivre, a straightforward jollity devoid of aesthetic pretentions. The sound quality, from sessions at Munich’s Herkulsaal, is excellent, so good we occasionally hear Pollini himself humming along, no doubt much to the chagrin of the engineers. It’s never a distraction though. All round, a solid Beethoven sonata recording. The completion of a set, maybe, but it doesn’t feel like the end of a road. And on the strength of these performances, Pollini is still going strong.